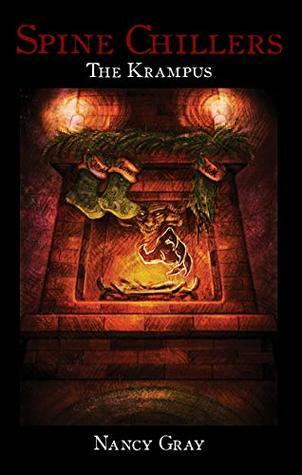 Book Lovers Life: Spine Chillers: Krampus by Nancy Gray Review! Christmas is a time for peace and good dreams, but for Nick it would soon become a nightmare. When he starts skipping classes to hang out with the bullies at school, strange things begin to happen. A horrifying apparition haunts his dreams and tears his stocking into shreds! Finally, the beast crashes through Nick's bedroom window, throws him in a sack, and spirits him away to its lair. Nick finds himself in a world of perpetual twilight where he will have to find his way home before becoming trapped forever, or worse. THE KRAMPUS is hungry and the oven awaits a fresh meat pie! Nick starts hanging out with the bullies of the school, things start going wrong for him. He is almost expelled when the bullies put a cherry bomb in the toilet and he is there when it happens. He starts to realise that these people aren't ones he should be hanging with, but it may be too late because a figure is following him, a figure who shouldn't be real and who eats naughty girls and boys. I started with this one, and while it can be read as a stand alone, there are some references to past events in the Spine Chillers series. Anyway... This was a good, somewhat spooky read. It takes a while to fully get going, but once it did, it was good. At the start, I really didn't like Nick and didn't care what would happen to him, but eventually he grew on me a bit. I still didn't truly like him, but I could tolerate him. The idea of Krampus is awesome, and while the author stuck to the idea of him, I felt like the execution of it could have been scarier. Now I know this is a middle grade series, and I know it shouldn't be too scary, I just felt like the atmosphere throughout the book could have been spookier! One thing I really didn't like about this book was the fact that the author made the characters always take the bulling, they never reported it because they said it would make things worse. I really thought this was a bad message for young kids. My eldest son was bullied and if he had said nothing, it would have got worse and kept on going. He told me and we were able to put a stop to it. In all, a good read and I'm looking forward to reading the next few.